Heat oven to 350°F. Spray pie plate, 10x1 1/2 inches, with nonstick cooking spray. In small bowl, mix all Brown Sugar Topping ingredients; set aside. Place all Pumpkin Pie ingredients in blender or food processor in order listed. Cover and blend until smooth. Pour into pie plate. Sprinkle with topping. Bake 50 to 55 minutes or until knife inserted in center comes out clean. Cool 15 minutes. Refrigerate about 4 hours or until chilled. Add fresh orange slices for a fat-free garnish. Microwave Directions: Prepare as directed-except use microwavable pie plate. Elevate pie plate on inverted microwavable dinner plate in microwave oven. Microwave uncovered on Medium (50%) 20 to 30 minutes, rotating pie plate 1/4 turn every 5 minutes, until center is set. Let stand uncovered 15 minutes on flat, heatproof surface. Who needs crust when you have custardy pumpkin pie filling to focus on? 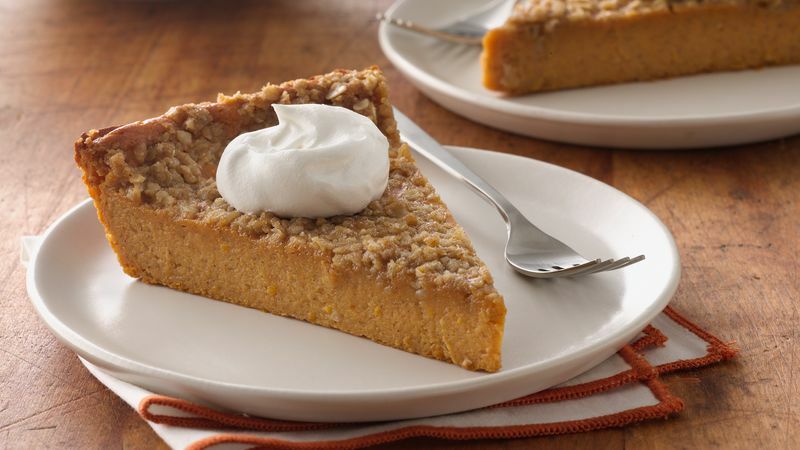 This crustless pumpkin pie recipe is a unique take with a brown sugar and oatmeal topping instead of a crust on the bottom. Not only that, but this recipe includes grated orange peel for a fresh twist. The filling is easier than ever because all you have to do is pop the ingredients—except for the topping—into your blender or food processor and process until smooth. Then simply pour it into a prepared pie plate, sprinkle with the topping, bake and cool. Classic pumpkin pie calls for evaporated milk and whole eggs, but this one uses lower-fat ingredients: skim milk and egg whites. To get the most out of your baking, we have all the tips you need on how to make pumpkin pie perfect every time. And just in case you need it, we also have a recipe for classic pumpkin pie.